If you’re wondering what this actually is, read on. The clues are in the name (as they usually are). AMINO – the H2N on the left hand side is an amino group ACID – the COOH on the right hand side is a carboxylic acid group (simply an acid) The hydrogen (H) on the bottom is there all the time (just like the amino group and the acid group), while the R group is the variable which determines what particular amino acid this will be. For example, if the R group was a hydrogen, the amino acid would be glycine. The next diagram shows condensation, and the subsequent formation of a bond between two amino acids (any two). This bond is a peptide bond. The resulting molecule is called a polypeptide. The R group (functional group) on the amino acid also determines the characteristics of that amino acid, including whether it is basic or acidic, polar or hydrophobic. 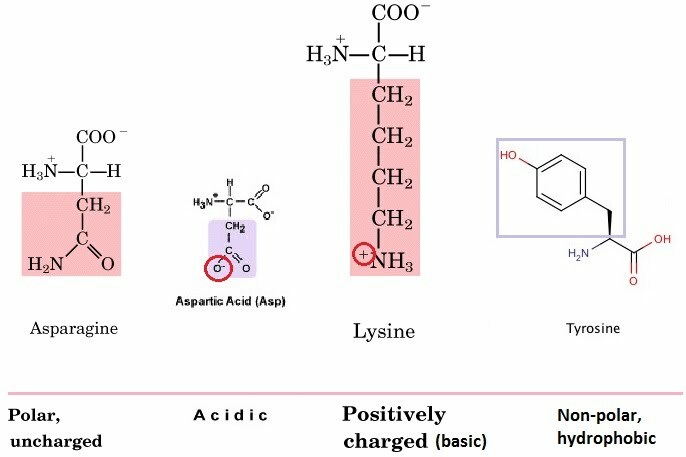 Amino acids can be charged (positively or negatively) or uncharged, polar or non-polar. On asparagine, for example, it is the extra carboxyl (CO) group that makes it polar. The different extent to which different amino acids are hydrophobic or hydrophilic determines how they behave in the technique called chromatography. Paper chromatography involves using a defined piece of hydrophilic chromatography paper and placing a droplet of the mixture at the bottom, in the middle of the paper. This section is then immersed in a solvent (e.g. alcohol) which is drawn up the section of paper through capillary action. 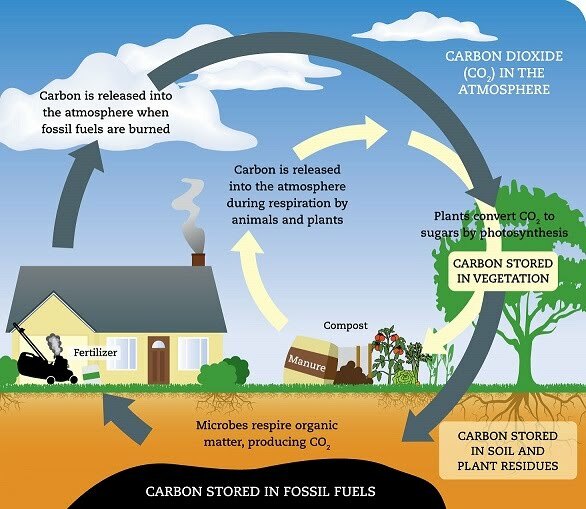 Depending on their chemical properties, some components of the mixture will be drawn up with the solvent, while others will lag behind or not move at all. This separation is enabled by their interaction with the stationary phase (the paper) and the mobile phase (the solvent). The polar uncharged, acidic and basic amino acids such as asparagine, aspartic acid and lysine are all more hydrophilic compared to tyrosine which is hydrophobic. The water affinity of an amino acid determines how far it will travel during paper chromatography. A higher affinity for the solvent (as opposed to the hydrophilic paper) will make an amino acid travel further. This means that tyrosine would be expected to travel further away from the starting point (and hence have a higher Rf which is the ratio between the distance moved by the compound to the distance moved by the solvent front) than asparagine and lysine. If the solvent front distance from the starting point at the bottom of the paper is 1, then the ratio for tyrosine is around 0.9, while that of lysine is around 0.3. Tyrosine travels almost as high as the solvent itself, while lysine makes it to less than halfway. Rf values aren’t totally reproducible but are useful for relative comparisons of amino acids. The theme of protein structure versus function is really strongly played on in exams, throughout A level biology. The core idea must be learnt, and this is it: Proteins have a primary, secondary, tertiary and (some only) quaternary structure. Protein primary structure is simply the sequence of amino acids in the polypeptide, while secondary structure refers to the conformation of the polypeptide. 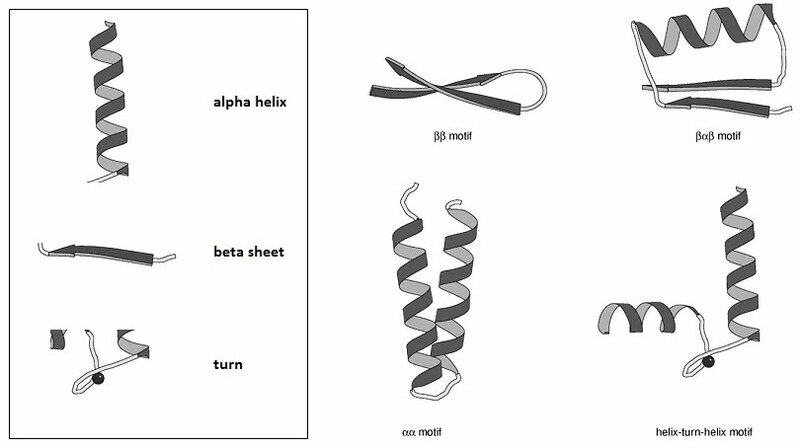 This can be an alpha helix, a parallel/anti-parallel beta sheet, or a turn. The tertiary structure of proteins is their 3D shape which is highly folded and has a unique structure. This structure gives proteins their specific function. For example, if insulin was misfolded, it would cease to function properly. 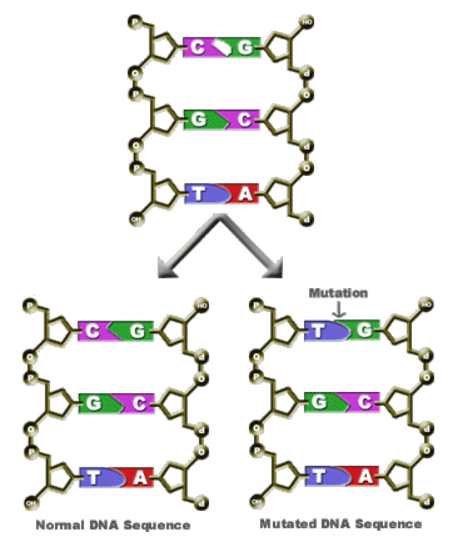 Of course though, the origin of misfolding is likely to be in the primary structure, due to a mutation. For example, if the gene responsible for coding the amino acid sequence for insulin was mutated, then the insulin’s primary structure (which is the string of amino acids) would be different, leading to a different secondary structure, tertiary structure, and ultimately, a lack of proper function. Ionic bonds are weaker than peptide bonds, but stronger than hydrogen bonds. These are momentary bonds between the partial negative charge of an oxygen atom in relation to an available partial positive charge of a hydrogen atom. Hydrogen bonds are the weakest, while disulfide linkages, bonds or bridges are the strongest. They are covalent bonds between sulphur atoms. Covalent bonds involve a sharing of electrons rather than exchange like ionic bonds. These bonds are key to the maintenance and formation of a protein’s specific three-dimensional structure. 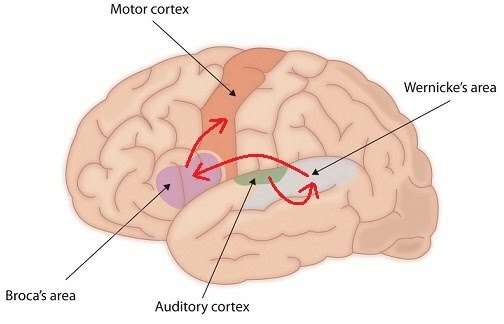 In turn, the structure determines function. There are two classes of protein: fibrous and globular based on their structure. 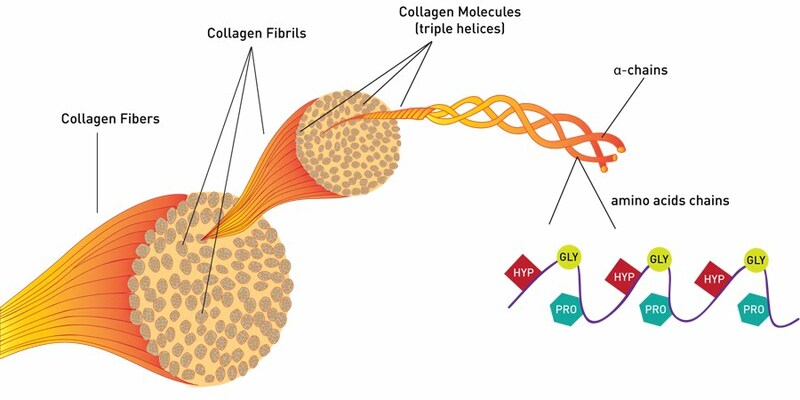 Fibrous proteins don’t usually have a tertiary structure at all, simply forming parallel chains of polypeptides, often cross-linked at intervals to maintain a greater overall arrangement that serves in the structure and support of various tissues including hair, nails and collagen. They are mostly not soluble in water. Globular proteins on the other hand have a tertiary and sometimes a quaternary structure, are spherical hence the name of globular, normally are water soluble and serve in metabolism such as carrying oxygen in the blood like haemoglobin. Collagen provides support in skin, bones, teeth, tendons and more. It is very strong and relies on hydrogen bonding to keep its three polypeptide chains together. 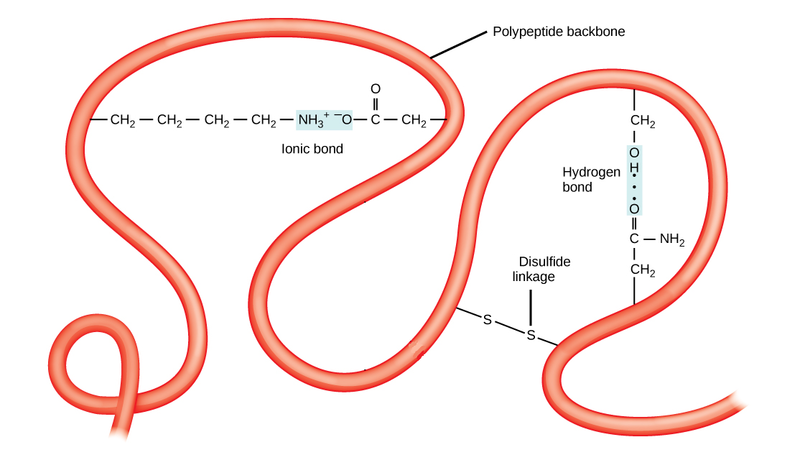 The polypeptide chains are made of hydroxyproline, glycine and proline which are different amino acids. Haemoglobin carries up to 4 oxygen atoms in red blood cells, unloading them in oxygen-poor cells as needed, and replenishing them from the air we breathe, in the lungs. The extend of its loading with oxygen determines its red colour which otherwise is purple. 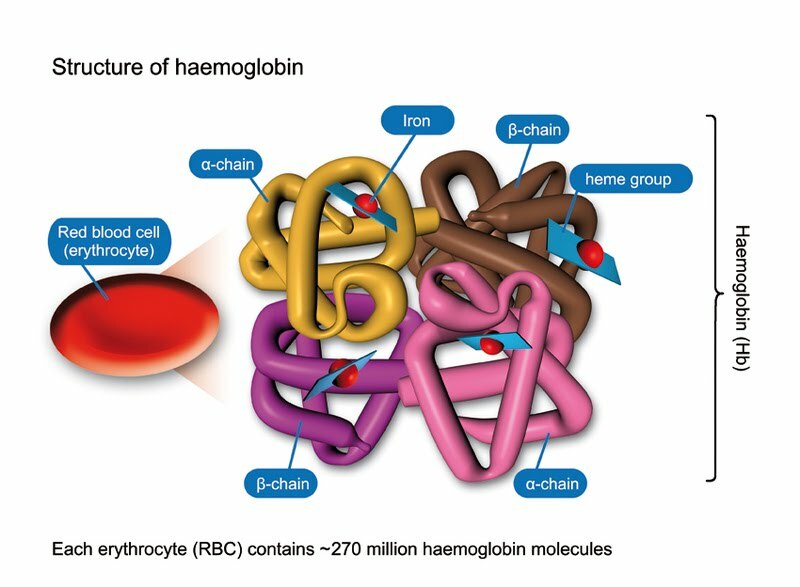 The quaternary structure of haemoglobin involves iron ions at its core, 4 of them for each oxygen available for loading. These are called haem groups, and are known in proteins as prosthetic groups. They are of non-protein origin, but bind tightly with the protein to enable its function. The haem groups are each contained at the centre of 4 polypeptide chains, 2 alpha chains and 2 beta chains. The interactions between amino acid R groups in hydrophobic regions determine the bonding and hence the protein conformation, alongside all the other types of bonding. Haemoglobin subunits show cooperativity in their function. When the affinity for oxygen of one subunit changes, so does the affinity of the other subunits. Van der Waals interactions such as hydrogen bonding, previously mentioned, contribute as well as the ionic bonds and disulfide bridges (see previously). Temperature and pH affect the bonds between the R groups of amino acids. Especially when it comes to proteins that act as enzymes, catalysing reactions in the cell, a loss of function outside optimal temperature and pH is critical. Upon disturbance of the cells lining a blood vessel, a cascade of events leads up to the coagulation of the blood and restoration of a protective barrier between the tissue and the environment, preventing further bleeding (hemostasis). Blood turns from a liquid to a gel. Many aspects that cause coagulation also contribute to defence against pathogens. For example, as the blood clots, it traps bacteria. Some clotting components are also toxic to some bacteria. Clotting begins with platelets forming a plug and initiating the release of clotting factors such as thromboplastin. This is a plasma protein which turns prothrombin to its active state, thrombin. 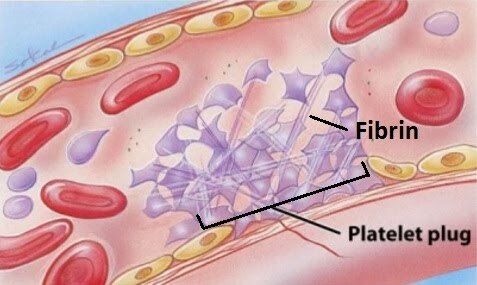 Other clotting factors including calcium ions and vitamin K.
Thrombin recruits soluble fibrinogen and converts it into insoluble fibrin which covers the wound and contributes to the platelet plug by strengthening it and aiding against pathogens and bleeding. First-aid employs techniques for aiding clotting and preventing blood loss. In the absence of sophisticated treatments, pressure is applied to prevent blood loss. Depending on the severity of the bleeding, a simple sterile dressing is applied to protect the clotting and healing of the wound, or sophisticated anti-bleeding substances are administered to the wound e.g. gelatin sponges. Medicine Immobilised enzymes are also central to various diagnostic reagent strip applications such as blood glucose monitoring and pregnancy testing. In glucose testing strips, the enzyme glucose oxidase is used to catalyse the first reaction of glucose. Further reactions of its byproducts can be used to create a colour change. 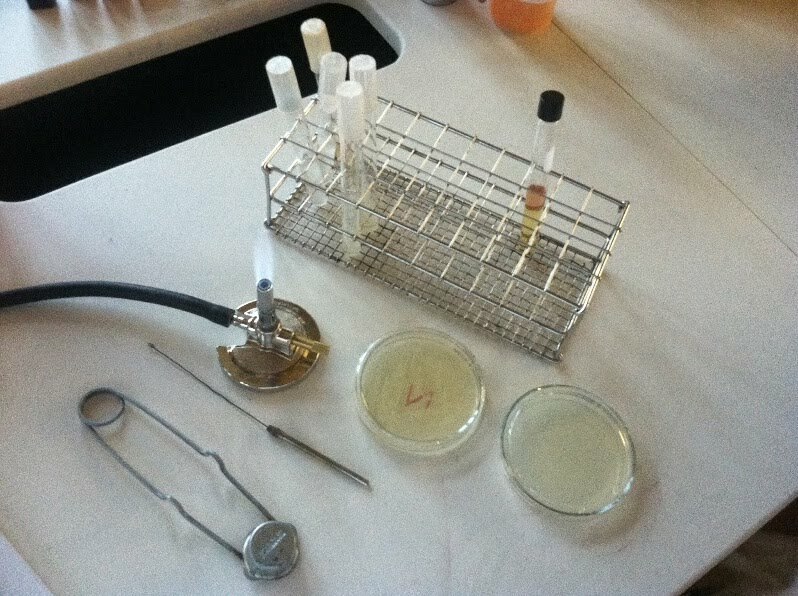 Many enzymes and inhibitors of enzymes are used in treatments. Specific enzymes are only produced by cells or active at times of illness, making them biomarkers of disease. This is useful in diagnosis by analysing blood, urine and septum samples for their presence, as well as for monitoring the progression of the disease. 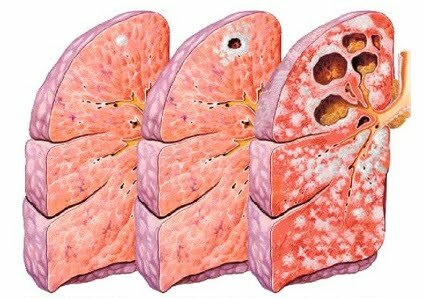 For example, the enzyme elastase is only produced by white blood cells during respiratory infections. Elastase breaks down elastin in the lung tissue via hydrolysis, leading to compromised lung function. 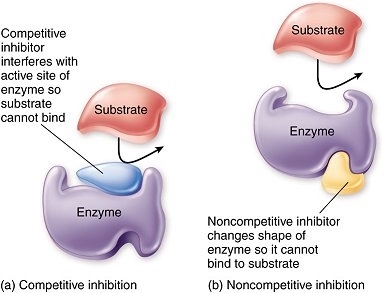 In the realm of treatment, inhibitors can be designed to counteract the action of enzymes that are active as part of a disease, directly or indirectly. Examples of these include antibiotics such as penicillin which inhibit the activity of enzymes key to the survival of bacteria, thereby treating the infected host; and sildenafil (Viagra) which inhibits the enzyme that degrades a smooth muscle relaxation compound, thereby enabling blood flow into the corpus cavernosum and causing erection. Aspirin and warfarin also work by acting upon and inhibiting enzymes. Aspirin is an anti-inflammatory drug that inhibits the action of an enzyme responsible for producing a pro-inflammatory chemical. Warfarin thins the blood by inhibiting the action of an enzyme that reactivates vitamin K which is key to enabling blood coagulation alongside clotting factors. The basis for blood compatibility is down to antigens found on the surface of red blood cells. 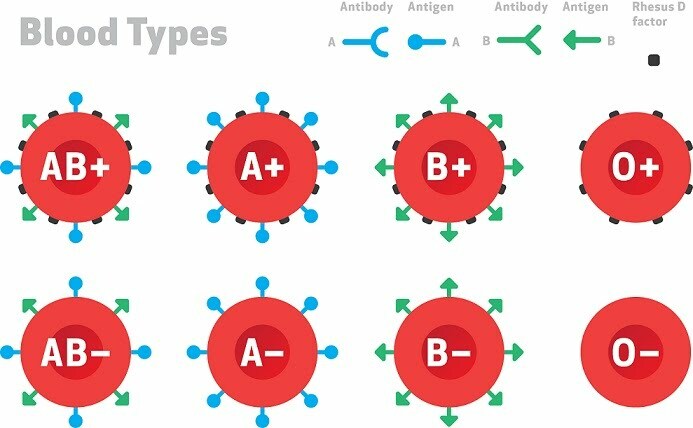 There are multiple configurations possible between different people: antigen A, antigen B, both antigens A and B, or neither (0). Additionally, rhesus antigen (D) may be absent or present. Antigens are immune system identification proteins. Those with antigen A, B or both cannot have antibodies against them in their blood (since it is part of themselves and recognised as such). Blood type 0 is the universal donor, as it presents no antigens. Type AB is the universal acceptor, as it recognises both antigens A and B as self. 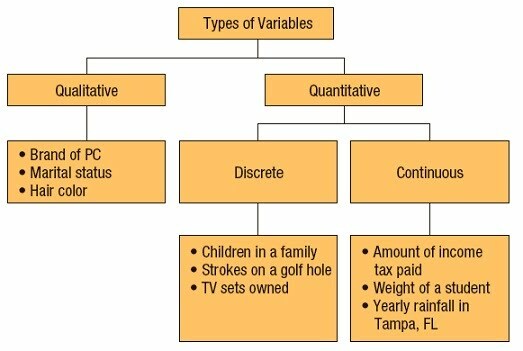 Types A and B can donate to AB and A, or AB and B respectively. They can accept from 0 and A, or 0 and B respectively. If an incompatible blood transfusion were to take place, antibodies against the new antigen on the donated red blood cells would be made. This would result in antibody-antigen complexes being formed on the cell surface. Agglutination of red blood cells would occur, i.e. clumping together; this would pose a dangerous threat to the recipient in the form of blockages in blood vessels. Parts of the body may be starved of oxygen, resulting in their breakdown or death. Rhesus antigen (antigen D) can lead to Rhesus disease in a newborn who is Rhesus positive, whose parent during pregnancy is Rhesus negative. No one has antibodies for the Rhesus antigen, so a previous exposure to a Rhesus positive foetus in an earlier pregnancy would give enough time to develop these antibodies. In a further pregnancy, these antibodies readily identify the baby’s Rhesus positive red blood cells and attack them. Extreme untreated cases of the diseases can lead to stillbirth. Current treatment for this includes screening early in pregnancy for Rhesus positive foetuses, and if this is the case, inject anti-D immunoglobulins that can remove the foetal cells before they are encountered by the parent’s immune system. This prevents the host production of antibodies against the Rh positive foetus cells. However, if these antibodies are already present from a previous pregnancy, the treatment won’t be effective. Closer monitoring of the baby is carried out before and after birth. Following donation of blood, various different products are made by centrifuging it to separate its contents. Whole blood, as the name suggests, it taken in its entirety. It is useful in the event of massive bleeding. 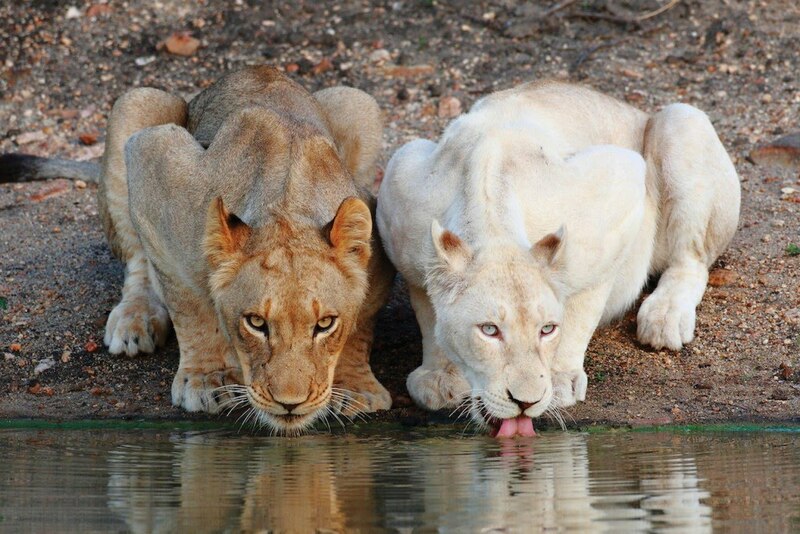 Leuco-depleted blood is whole blood without its white blood cells. Almost 100% of white blood cells are removed to prevent multiple possible complications arising from blood transfusion including passing over infections, cancer recurrence and adverse reactions. Packed red cells are isolated from blood and are useful for treating anaemia. Platelet and clotting factor blood is used in patients with e.g. leukemia to prevent bleeding. Chemotherapy affects the platelet count in their own blood. Plasma only is used to replenish a patient’s proteins and electrolytes crucial to health, and is used in patients with liver failure, severe infections or burns.